The image above grabbed our attention while searching for HDR City Images. Taken using 3 exposures which are then subsequently merged using Photomatix the photo by Paulo Barcello’s is one of the best we have seen. 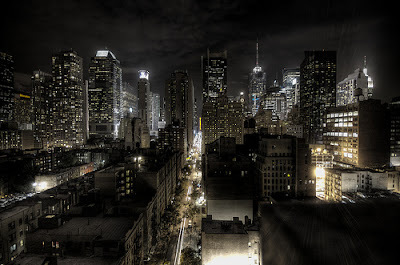 It is well worth visting Paulo’s Flickr page to see the full size version of New York at Night. Perhaps you could start with telling us what HDR stands for? Sure – its High Dynamic Range Imaging – which basically is where you take multiple exposures of the same view and then merge them into a single image. This captures a range of lighting levels that brings out parts of the images that would not normally be seen in a single photograph. It sounds complicated but is in fact remarkably easy and once you have used it the technique can be addictive..
We will have a tutorial online soon as well as some examples taken out and about in London. – just off to fix the typo btw, thanks for pointing it out..